This will be the last installment in the Thanksgiving prep series since next week is the big week, and we’ll all be in the midst of prepping, cleaning, etc. 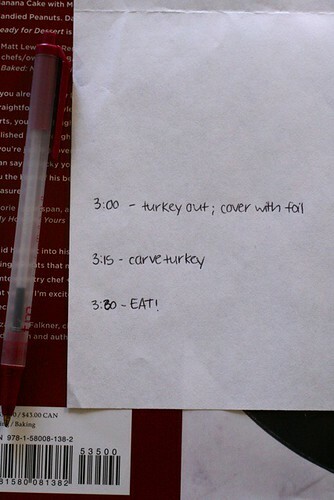 My last bit of planning involves making a detailed timeline for Thanksgiving day itself. Any time I host an event with multiple dishes needing to be prepped, assembled, cooked or baked, etc. and get everything finished at the same time, such a timeline is essential. Even if things get a bit off track or if you get ahead of schedule as I did last year, the timeline helps keep me focused and prevents me from forgetting things. Especially when guests are in the kitchen talking with you as you prepare the meal, you can get distracted but a quick glance at the list gets you back on course quickly. 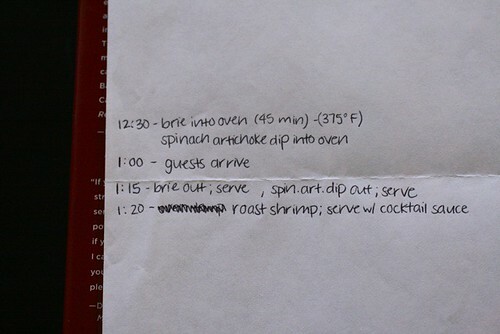 With the arrival time in mind, I plan times to have various appetizers ready and list those accordingly with times they should go into the oven, come out of the oven, etc. You want appetizers to be warm for guests as they arrive, and also not so close to the meal time that people are full. I use the same principle when planning the various side dishes that need to be on the table when the turkey is ready to be served. Thankfully the turkey roasts at 350˚ F, which works for all of the sides I have planned. Even if a recipe indicates a temperature of 375˚, you can certainly bake it at 350˚ without issue, maybe adding a few minutes to the baking time if necessary. 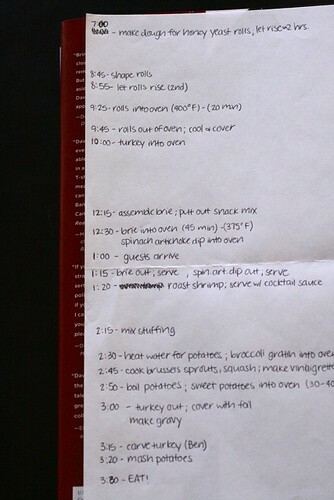 So, once the arrival and meal times have been established, all the side dishes can be filled in around that timeline. There are still some big gaps which I will surely fill in later as I think of additional small details, but this is the basic framework I use for planning. Finally, the last list I make for such an event (which I haven’t made just yet) is a list of what bowl or platter each dish will be served in. You don’t want to be rushing around at the last minute trying to find more platters or bowls, or realize that the dish you just spooned the mashed potatoes into would have been better used for another purpose. 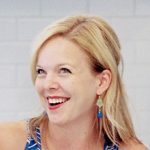 Planning this in advance leaves little to be decided at the last minute, so all you really need to do is stick to the lists and execute the meal plan. And that’s it. That’s how I plan my Thanksgiving. Now it’s almost time to make it all happen. Don’t forget, the most important thing is to enjoy the day with your loved ones. If something goes wrong, it will be okay so don’t stress, just have fun!